EADA’s International MBA participants are among the world’s best negotiators. 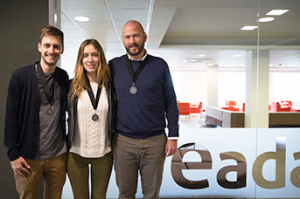 The World Championship in Negotiation –the final round of the latest 2018 edition of The Negotiation Challenge (TNC)–, took place fron April 5-8 in San Francisco, EADA’s team took second place behind their American competitors at the Washington College of Law (Washington D.C., USA). The stars of this success story are Tatiana Gottlib (Israel), Sigthor Jonsson (Iceland) and Agustín Mestre (Argentina), who scored higher than than teams from institutions including UC Berkeley School of Law (Berkeley, USA), Harvard Kennedy School (Cambridge, USA), University of Connecticut (Storrs, USA) or Kyoto University (Kyoto, Japan). Among the 50 teams that began the Challenge together, only 18 made it to the finals in San Francisco. In San Francisco, teams competed to participate in the grand finale by participating in four eliminatory qualifications rounds. During the event, EADA’s participants faced several realistic negotiation situations, such as buyer/seller, union/company, Tesla/supplier, Apple and Sony Music (streaming music) and football player/manager. Teams had little time to prepare a comprehensive negotiation strategy –just five minutes in the first round. The Challenge provided a unique opportunity for international networking, with the change to meet students from diverse nationalities, backgrounds and cultures. Moreover, the competition was held in front of an international jury composed of top lawyers, business leaders and professors from around the world. Sigthor highlights the multicultural environment at EADA, which he says “helped understand the other team members from diverse universities, backgrounds, nationalities and cultures”. He describes the Challenge as a “priceless experience” in which he and his team members “learned a lot from the other teams and also improved our negotiation skills; we are now more prepared to face any negotiation situation”.